Hundreds of terrified Christian families have fled Mosul to escape extremist attacks that have increased despite months of U.S. and Iraqi military operations to secure the northern Iraqi city, political and religious officials said Saturday. The video series is in Spanish. From time to time I get updates reading this post. The following is the most recent update that was left in the combox by an anonymous commenter. "The Union City, NJ monastery of cloistered Dominican nuns has ended as a community. Of the six nuns reported on in the Order of Preachers' Monialibus, two nuns have died, one is in a nursing home, one has transfiliated to the Corpus Christi Monastery of Dominican nuns in the Bronx, and the other two have moved out of the Blue Chapel. Of these last two nuns, they answer now to the Provincial Prior in New York City who is partnered with the New Jersey bishop to find the nuns a home". An aspect of the document often overlooked today is its grim warning that governments might “impose” contraceptive methods on citizens. are mandatory birth control and abortion on the horizon for America? Article by Frank M. Rega, S.F.O. I was reading Fr. 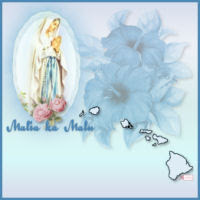 Z's post today and I thought I would post about the Diocese of Honolulu's Spiritual Moms Apostolate. It was back in December of last year that I first read the Zenit article Vatican Seeking Spiritual Moms for Priests. After reading that article, I felt the calling to have Catholic women in the Diocese of Honolulu spiritually adopt a priest or seminarian. The first person I considered to help coordinate this task was my friend Easter of a Tribute to Our Priests. Easter also has a deep love for Catholic priests. 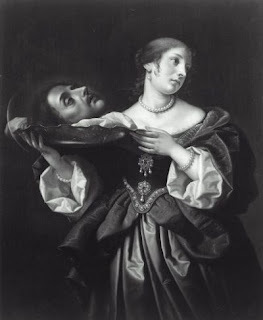 With her outgoing and friendly personality we would have no trouble convincing women to spiritually adopt a priest. Like any loyal Catholic, we first sought the permission and approval of our bishop Clarence (Larry) Silva. It is only in Hawaii that a Catholic layperson can literally "bump" into our bishop on the street and talk to him. Well, that is what happened on a few occasions. I remember the first time Easter and I approached our dear Bishop was at the March for Life in January. Bishop Silva, a very humble man of God, willing heard all about our proposed idea for what we mistakenly referred to as a ministry; but what is more correctly an apostolate. There were certain issues Bishop Silva was concerned with and we set out to set his mind at ease. With the immeasurable help of friends on the island such as Steve Odo, Fr. Peter Dumag (Director of Vocations)., Fr. Pascual Abaya and Fr. 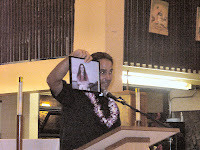 Marc Alexander (the vicar general), and many women at different parishes, we were able to get the word out to the women in the Diocese of Honolulu, including the neighbor islands. I am happy to report that nine months later, all of our priests and seminarians (including our bishop) have been spiritually adopted. There is also a small list of spiritual moms on the waiting list for a spiritual son to adopt. Easter and I were only instruments in God's hands. 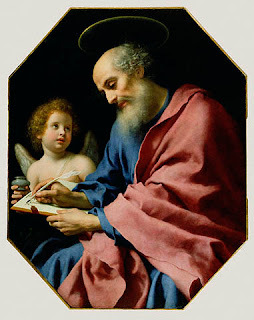 In fact, as Easter stated on many occasions to many people "Ours is a quiet apostolate". The "Moms" and I feel very privileged to be able to spiritually adopt a priest. Each of us has committed ourselves to praying for our own spiritual son daily. We especially remember our him during Holy Hour of Adoration, attendance at Holy Mass. We offer our Rosary and Divine Mercy Chaplet for their intentions. We hope with our efforts, we will protect our beloved priests from attacks by the Devil and instead all our priests and seminarians will grow in holiness. We know our blessed Mother will keep her priests close to her heart. We also pray for more vocations to the priesthood. If you would like to consider starting a Spiritual Moms Apostolate in your diocese, please check out the resources at the side bar. There is a very good article about the women discerning to become spiritual moms in the Tulsa Diocese. I am hereby officially tendering my resignation as an adult. of an 8 year old again. stand with my friends on a hot summer day. I want to return to a time when life was simple. but that didn't bother you, because you didn't know what you didn't know and you didnt care. all the things that should make you worried or upset. That everyone is good and honest. be overly excited by the little things. I don't want my day to consist of computer crashes, mountains of paperwork, depressing news. I want to believe in the power of a smile, of hugs, a kind word, truth, justice, peace and dreams. The imagination, and making angels in the snow, of seeing rainbows, jumping in puddles & dancing in the rain. So...here's my checkbook and my car keys, my credit cards and all my responsibility. I have officially resigned from adulthood. Thanks to the Mile High Mama for creating this beautiful poster. 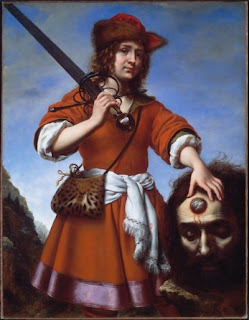 Painter, born in Florence, Italy, 25 May, 1616; died 17 January, 1686. The grandson of a painter, he seems to have inherited a talent for art. 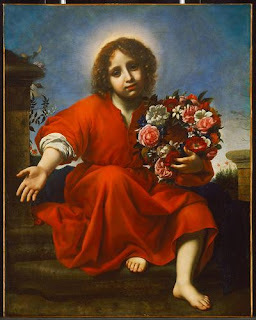 He studied under J. Vignali, and when only eleven years old he attracted attention by the excellence of his work, notably a figure of St. John and a head of the Infant Jesus..."
one hour to speak to the good God. we should stay with Him forever. I found this prayer in one of my prayer books. I hope it helps someone who may be needing it. I also encourage those who can to offer this prayer for those in need. that economics plays a large part in it. for themselves and t heir families. and to keep up with their particular state of life. Right now I find myself in a bad economic condition. to take care of myself and my family. Please help me in this danerous situation. while at the same time striving to increase those means. Let me never lose heart but continue to work on. in the knowledge that everything else will be givne me together with it. This blog was shared by my brother's friend S when I was home in the Summer. I recall the beginning of my search for online eyeglasses, and the confusion I had. How would I know that they'd look good on me? How do I read my prescription? There were so many questions and less information. Things have gotten better in just the last year. 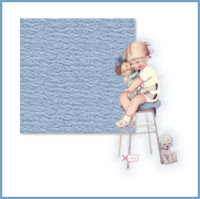 The retailer websites have some better information, and now there is a wealth of information in the forums of this site. Have a question? Someone WILL answer it if you post it. 1. Get your eyes checked. This is important from a prescription strength and a eye health perspective. Keep a schedule and get this done annually -- yes, I've changed my tune a bit on this. 2. Get your full prescription. You paid for it. Make sure you leave with it. If you didn't bring it with you, give them a call. The law says they need to provide you with it. 3. Get your Pupillary Distance (PD). This isn't a part of your prescription by default. See here for some ideas on getting this measurement. It's important and it's not that difficult to get for a single vision prescription (bi-focal or multi-focals require a bit more expertise). 4. Get your frame measurements. There are a couple of good ways to do this. I liked my old frame style, so I knew that frames with similar measurements would likely end up being decent looking. 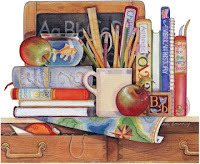 If you're looking for something new, find a pair you like at the store and write down the measurements from the frame. In either case, the measurements are typically stamped inside the temple and/or on the bridge. 5. Find a frame. Hit the websites listed to the left and start browsing. You're looking for sizes as well as style here -- don't forget that! If the site offers a way to drill down to a temple size, for instance, use it! It will save you a ton of time. There is no reason to look at all of the 130mm temple-lengths when you need a 140mm. 6. Choose your lens options. I was oversold on "featherwates" and hi-index lenses for years. Depending on your prescription strength and the lens size for the frames you're looking at, you may be fine with the standard thickness lenses. I like anti-reflective lenses and I'm amazed at how much I like the photochromic lenses. With the low cost of these glasses, pick up a pair with sunglasses lenses. I don't buy lenses that don't include UV protection -- neither should you. 7. Order up! Use a credit card (not a debit card) to aid in unlikely event of problematic resolution issues. Pay a couple dollars extra for faster shipping from a number of the retailers. 8. Wait. This was the hardest part for me -- mostly because I was without a spare pair. It gets easier when you're not in that pinch. Good luck and PLEASE let us know how it goes in the forums. They're a valuable resource because of your input. in atonement for our sins and the sins of the whole world. Father forgive Joseph and those that he prays for. A big mahalo to the Maritime Sentry for this prayer. My family and I attended the Divine Mercy Conference on Friday. It was held for a couple of reasons. Firstly, many people had responded positively to the conference held by the Eucharistic Apostles of Divine Mercy held two years ago and had requested another conference. Secondly, it was in celebration of the 10th Anniversary of Our Lady of Good Counsel's Perpetual Adoration of the Blessed Sacrament. It was a three day conference which included youth session. We attended the Friday evening session. Four speakers had been invited to this conference. Fr. Donald Calloway, Fr. Deogratias Rwegasira, AJ, Bob and Maureen Digan. Unfortunately, Maureen was unable to travel. Did you know that the two miracles that were approved for Sister Faustina's beatification and canonization, were both in the United States? 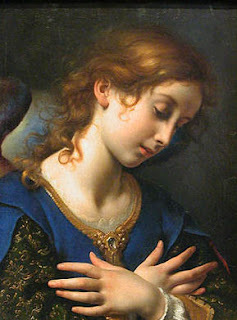 Well, Maureen Digan was one of those who was the recipient of St. Faustina's intercession and ultimate miracle by God. The conference started off with the prayer of the Holy Rosary and then the celebration of the Holy Mass. After a short break, Fr. Calloway was the first to speak. As usual, he held his audience captive with the story of his conversion. He also reminded us over and over again about God's Divine Mercy. He specifically reminded us that our dear bishop Larry had consecrated the State of Hawaii to the Divine Mercy. When the earthquake hit the Big Island not too long ago, no one was killed. 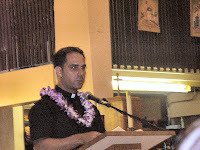 Father Calloway told us that Kauai also has a EADM division there. That may be the reason that the only abortion provider on that island was recently closed. Thank God! 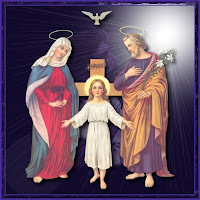 Father Calloway opened our eyes to the fact that never before in the history of mankind has Mary been appearing more frequently all over the world. It is when times are tough that God sends His mother to us for help and more importantly to persistently correct us. 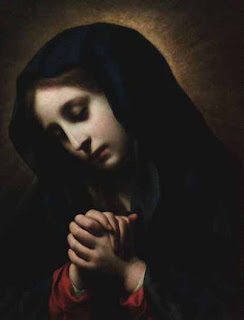 BTW, did you know that the first apparition was when our Blessed Mother appeared to Saint James? 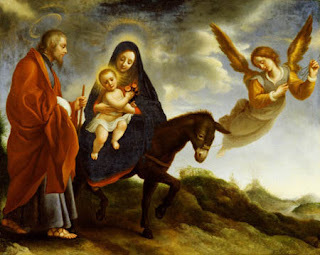 In 40 A.D. while Mary was still alive, she appeared to St. James in Saragossa, Spain. 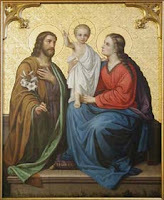 Families are in need of Divine Mercy. Marriage is under attack, the family is under attack starting with abortion and other evil things that destroy the family, God's Domestic Church. It is no wonder then, that in our time, God chose John Paul II to be Christ's Vicar on Earth. - He rescued and gave us the Divine Mercy message. 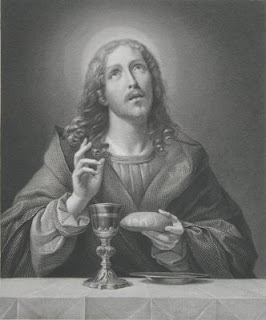 - He proclaimed Divine Mercy Sunday. The Blessed Sacrament is medicine for the soul. It is radiation therapy when we come to the Son in adoration. He makes our souls beautiful again. We are in a war, a war where Good is fighting evil. How do we arm ourselves? 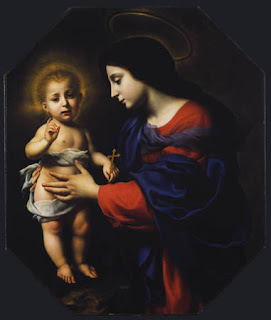 We use the most powerful weapons against Satan, the Holy Rosary and the Divine Mercy Chaplet. One of the last things I remember Father Calloway stressing is that we should be merciful to members of our own family...until it hurts. 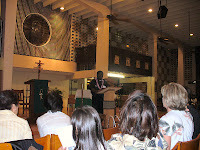 The second speaker of the evening started speaking after the Eucharistic Procession into the Church. 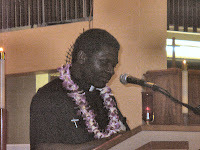 Father Deogratias Rwegasira, A.J. is a missionary priest of the Apostles of Jesus and is a composer and musician. He spoke on the history on how he came to compose the music for the Divine Mercy Chaplet as well as one of the Fatima prayers. A very interesting story which includes the healing of a woman who sang on his CD and whose husband is a relative of Blessed Andre Bessette! It is because of this couple that Father has been able to promote his CD which supports 166 seminarians! 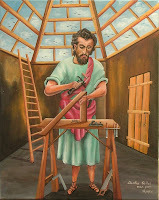 Father Deo arrived in the United States from Kenya, April 30th 2000, the first Sunday after Easter, Divine Mercy Sunday, when Sister Faustina was canonized. Father Deo stressed that we should always pray the Divine Mercy Chaplet in front of a person we know is very sick or may be dying. That person then will receive all the graces of Divine Mercy. 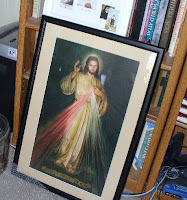 Father led us in singing the Divine Mercy Chaplet in front of the Blessed Sacrament, exposed. It was a very beautiful time of Adoration. ..A young man goes to the master and he says, "I want to find God." And the old man says, "All right." He takes him down to the river, and says, "Put your head under the water." Then the old man puts his hand on his head and holds it under the water. When the young man wants to get up, the master continues to hold his head down until at the last minute, he lets him up and the man gasps for air. The old man says, "When you want God the way you just wanted that breath, you'll find him..."
Homeschoolers - A Threat to America?? ?